Julie Zickefoose on Blogspot: Orchidpalooza! A blushing Phalaenopsis does its thing. 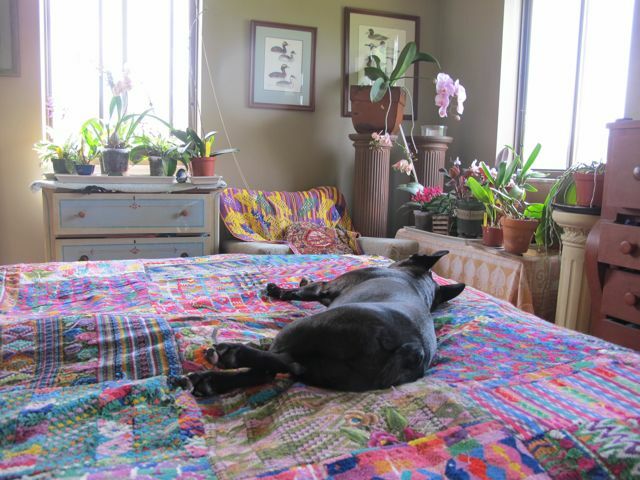 We're home, home from North Dakota as of last night, and there is a verra happeh puppeh kespraddled out on the Guatemalan bedspread. Note crossed hinders. People who are besotted with their dogs think things like crossed hind legs are so cute. I've no idea how they look to people who aren't besotted. I don't know what it's like not to be besotted over Chet Baker. Mmm mmm mmm, he's a licorice bonbon. Speaking of besotted, I love my housesitter Monica, who is a superb plant waterer, hamster wheel washer, and macaw coddler. It's amazing to be able to leave for a week and come back to find everyone thriving. The only casualty: a lightning struck cordless phone. Blaaaa. It was a good one, too. Now, if I can replace the base unit, I guess we'll have six handsets. Three to use and three to drown. The orchids are going bananas. Sometimes I wish they'd do this in midwinter, when everything outside is gray. But I'm just glad they do it. Boy, am I glad. All my orchids live in one bedroom, because the light's perfect there and because they're ganged together on water-filled trays, the humidity's better too. This is one of two south windows. I keep the south Venetian blinds slatted horizontally all winter, but by the end of May I can raise them completely, because the sun doesn't slam in any more. 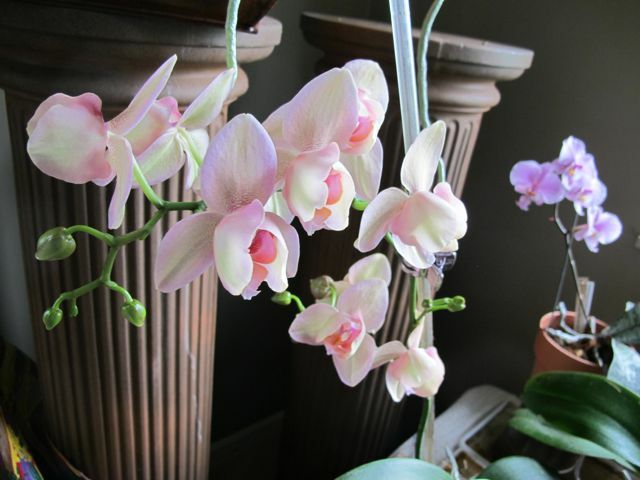 South windows are actually kind of dark in summer, so the orchids get the indirect light they like. You can really cook them in a south window in winter, though, hence the slatted blinds. Here's the east window grouping. I keep it up all winter--orchids adore east winter sun. But I have to keep the east window slatted in summer. So I do this little dance to make sure nobody gets sunburned. Slat the east in summer, slat the south in winter. Orchids like spots and bars of sunlight, not a steady burn. As you can see from these photos, they like it a lot! 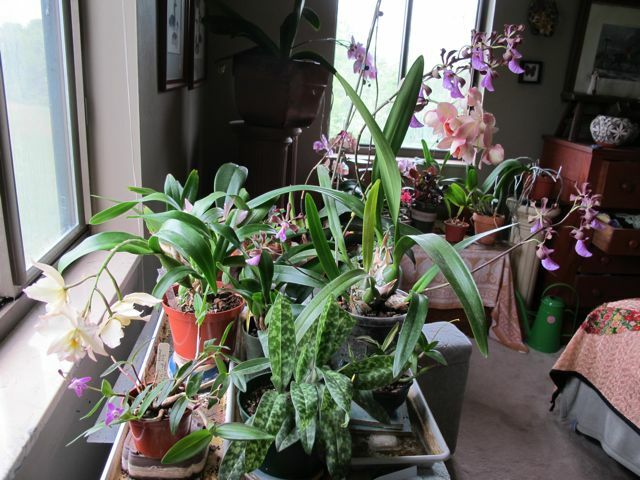 Some of my orchids are refugees from the big box stores. I got two of these little peach beauties, a Phalaenopsis hybird, at Wal-Mart, where they were, of course, slated to die badly. They're the most floriferous orchids I have. They have a bit of a genetic defect in that the petals never open all the way, but they're still pretty, and fragrant too. I prize this plant for its silvery mottled leaves as much as its glorious blossoms, which is a good thing because it's only bloomed twice for me in five years. The sweet thing about schilleriana crosses is the leaf mottling, but they also have this marvelous lyre-shaped lower lip. Mmm. Gorgeous. This is going to be a magnificent plant when it grows up. Super-slow grower. Got that one at a flower show in Chicago in '06, carried it home in a backpack as a seedling in scary cold March. Iwangara "Apple Blossom" is a very groovy trigeneric hybrid that's highly fragrant as well as floriferous. It's vigorous and divides easily. Pretty much the perfect orchid. The mealybugs and Boisduval scale think so, too, so it gets frequent sprayings with organic clove oil. I love the corsage-like flower form, and the fact that it'll throw out a spike after the first one is done, extending the blooming season for a month or two. 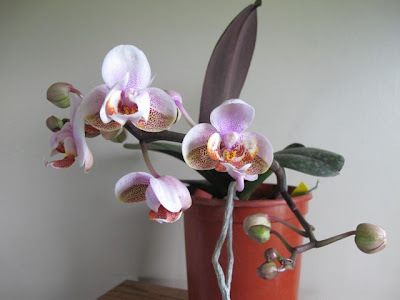 Donna of KGMom Mumblings and I have been comparing notes on our sullen little Phalaenopsis "Nobby's Amy" plants, which have sat like turds on our windowsills for something like five years without blooming. Well, I'm here to tell ya, Donna, mine finally did it, and in a big, big way. I'm not gloating, but I'm pretty thrilled. My delight is slightly compromised by the fact that all but a few of the blossoms are deformed, with weird oversized, fused or missing petals. Here's one of the perfect ones, with a little guy inside smiling and jumping up and down with pride at his huge accomplishment. Yahoo! Look at his happy lil' face! See that clean demarcation of color on the two outer petals? 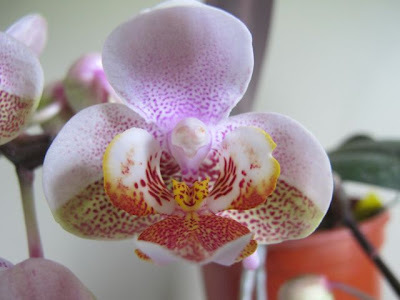 I can tell it's got Phalaenopsis violacea somewhere in its parentage, by that zone of demarcation. 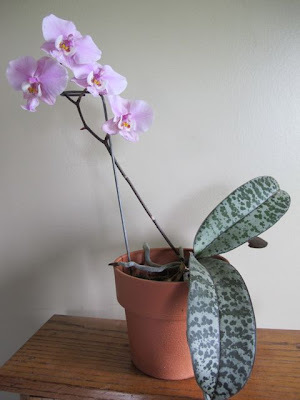 That plant is usually crossed into other Phal. hybrids because it's intensely fragrant, and can impart that to its hybrid children. Donna, did yours ever pop? 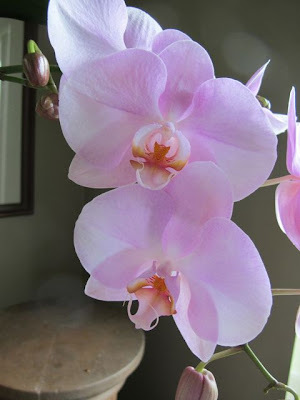 Genetic issues, like the peach Wal-Mart refugee that won't open all the way, or these deformed "Nobby's Amy" blossoms, show up with frequency in orchids. Remember, many of them are cross-bred two, three or even four times with other genera; it's a wonder they don't have more weirdnesses. People actually make trigeneric and quadrigeneric orchid hybrids, to see what they can do by crossing a Cattleya with a Laelia with a Brassaevola with a ...(fill in the blank). And I gotta say, they make some pretty darn neat plants. Improving on nature? I don't know. Having a ball? Sure. 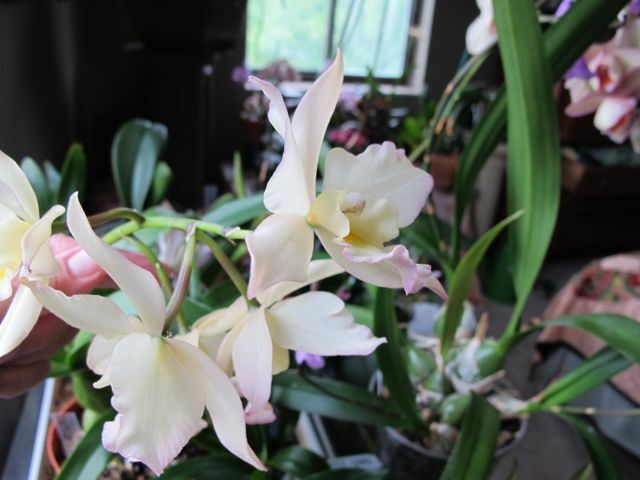 In my next post, we'll look at a couple of wild type ("species") orchids that I'm honored to host in the Orchid Room. 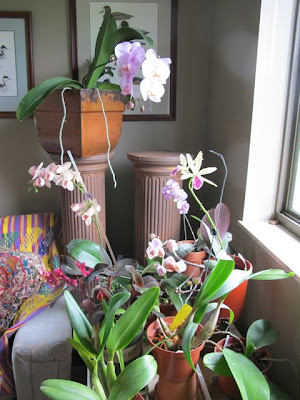 I love, love, love your orchids!! I'm able to hang mine out under the maple tree during the summer, but have to bring them in for the winter. I tried a new window this past winter and lost three of them. So sad. I'll try out bedroom south window this coming winter!! I often wander around the orchids at my local plant store, but I've never actually had the pleasure of taking care of one myself. I guess I'm imtimidated. I love that cute little face. You can really see it! Neat! Your orchids are beautiful. Showy blooms that last awhile. So cheerful. Thanks for posting them. 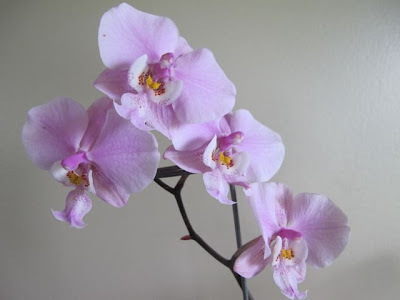 Your orchids are beautiful! Even from behind that looks like one happy puppeh. Your orchids are gorgeous. Now you've got me eyeing the supermarket orchids and thinking I should give one a try. Downstairs probably wouldn't work, since the south window's unshaded, but my upstairs office has both east and south windows, with the south one slightly shaded by the eaves and rain gutter. Do you think that might work? Go east, young Catbird, and don't let the moggies nibble on 'em or tip 'em over. Pedestals are good when there are kittehs around. Good luck! The orchids are lovely. So is the dog.